Manchester City's prospective new owners have declared they want the club to challenge for honours on all fronts. The Abu Dhabi United Group (ADUG), which is set to take over from Thaksin Shinawatra, has already helped seal the signing of Brazil striker Robinho. "We would like to be a lot better than last season, and we are eager for trophies next season," said ADUG spokesman Dr Sulaiman Al-Fahim. Thaksin has signed a memorandum of understanding with ADUG which would see the Arab company taking a majority stake in the club. The move has drawn comparisons with Russian Roman Abramovich's takeover of Chelsea in 2003. Since then, the London side have won the Premier League title twice, lifted the FA Cup once and reached the final of the Champions League. City have not won a trophy since the League Cup in 1976, but Al-Fahim believes the funds available to manager Mark Hughes should help bring silverware. 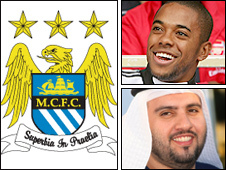 "We would like to see Manchester City fighting for trophies in every tournament," said Al-Fahim. "We don't just want Manchester City to be challenging for trophies in England, but also in the Champions League. We want them to be in for every trophy available." Former City star Mike Summerbee told BBC Five Live: "We are very, very lucky - Manchester City FC are a very big club and it's a wonderful thing for them. "It's about time we had little a bit of luck. A royal family has taken us over and we can compete with the biggest clubs in the country and in fact anybody in the world now." City, who finished ninth in the Premier League last season, face Chelsea in their next league clash at Eastlands on 13 September. Will Robinho light up the English winter - or pull another sulk? Robinho could make his Premier League debut in that match after the 24-year-old moved to City rather than long-term suitors Chelsea, who refused to match his asking price. Al-Fahim will try to attend that match, and wants to travel to England for talks with the club and the Premier League to clarify details of the takeover. In a statement released on Monday, ADUG said the aim would be for City to compete in the Champions League in the 2009-10 campaign, which would require a top-four finish this season. Although the club have started the season well and are third in the table after three games, Al-Fahim appeared to acknowledge the real hunt for trophies would begin next season. "A place in the Champions League is quite a jump from last season, but we are ready to sit down with the manager, find out the players he would like, and bring the right players into the club," Al-Fahim added. And financial advisor Amanda Stavely, who brokered the Abu Dhabi deal, said the Manchester club proved an entincing prospect. "The Premier League without doubt as a sporting brand is a great opportunity. We should be very proud of British football," she said. "Any outside or foreign investor can only be excited to get involved in world-class league. Manchester City sells itself."